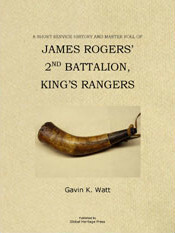 After more than thirty years of studying the loyalist regiments that served in Quebec during the American Revolution, author Gavin k. Watt concluded that Major James Rogers’ 2nd battalion, King’s Rangers was sadly overlooked and required additional attention. Major James Rogers' command of the 2nd Battalion of the King's Rangers in the American War of Independence/American Revolution, resulted in the forfeiture of his lands in Vermont. In 1784, he led a party of about 300 disbanded King's Rangers and their families to the Third Township of Cataraqui, later known as the Township of Fredericksburgh, in Lennox County, Ontario, where they were granted land. Rogers, who first settled in Fredericksburgh, where he became lieutenant-colonel of the militia, lived for a time in Prince Edward County, Ontario but returned to Fredericksburgh before his death on September 23, 1790. There are two main sections to this book. First is a brief service history of the 2nd battalion from its creation in 1779 until disbandment in 1783. Second – by consulting original and secondary sources, Watt prepared a Master Roll of three hundred and fifty-eight men listing alternate spellings of surnames and given names, rank, enlistment date, company, service details, age, height, place of origin, trade, wife and family, and place of settlement. Of course, not all of these details could be found for every man, but the roll is pleasingly complete. The King's Rangers saw extensive service in a wide range of duties, and could boast more than its fair share of notable characters. The majority of the King’s Rangers settled in Canada after the war and added their skills and vitality to the new settlements. This is a modest publication in terms of size, but then again the King's Rangers was the smallest Corps in the Northern Department during the Revolutionary War. Nevertheless this book fills a long-standing gap. If you have Loyalist ancestors in the Quinte area, there's a good chance you have a King's Ranger or two as they settled in Fredericksburgh Township in 1784. Some of the best known Loyalist names that have ties to the King's Rangers include Bell, Brisco, Dafoe, Kemp, Pringles, and of course Rogers. The first part of the book has a highly detailed but very reader-friendly Service History of the Corps in chronological order. The Corps began as a Central Department regiment but ultimately was transferred to the Northern Department. Had that not happened the Corps would have been disbanded in the Maritimes along with their 1st Battn. Thus quite a few descendants owe their Quinte area roots to Major James Rogers' desire to attach his Corps to the Northern Dept. during the War. Less than welcome initially, the Corps was accepted eventually and it worked out for Major Rogers. . The second portion of the book features the Master Roll covering all known who served in the King's Rangers. Details include surnames with alternate spellings, ranks, enlistment dates, company within the regiment, service details, age, height, where from and trade and family details where known. Of course information varies from man to man. With the focus on Adolphustown and the landing location of the Associated Loyalists, it is easy to forget that the King's Rangers settled immediately east of there and would have had a landing spot of their own along with the 2nd Battn. King's Royal Yorkers with whom they shared Fredericksburgh Township. The Master Roll of the Regiment will prove very useful for descendants, and many will find an ancestor whom they didn't realize served in the Corps. Only change I would offer is there appear to have been two John Diamonds who served, not one. One married a Loyst and the other married a Gordonier and the latter was the son of Jacob Diamond UE who also served.